Fire, Fire, FIRE! 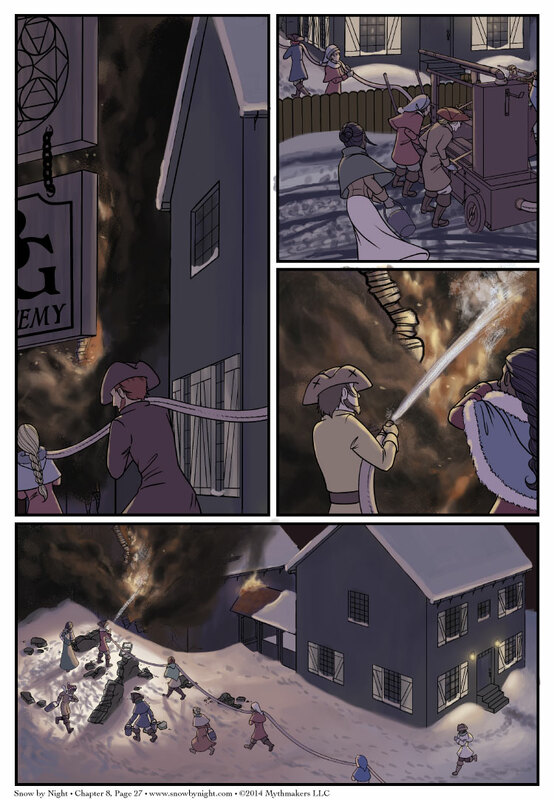 More colonists join the fight against the flames on Chapter 8 Page 27. Fires were a terrible threat to colonial towns in the 18th century. If left uncontrolled, a fire could wipe out an entire town, leaving the population to freeze and starve in the harsh winters of North America. You can read some of how the colonists fought fires on the Williamsburg site. As for the fire truck they’re using on today’s page, here’s the actual device. The Richard Newsham’s Fire Engine. You can see it in operation here. To see one of the panels from the upcoming final page of this chapter, please vote for Snow by Night on Top Web Comics. And our Art Contest is in full swing! Please vote for your favorite piece in the qualifier round. The top 8 pieces will move on to the single-elimination tournament. You can vote daily through Saturday at midnight. I think you forgot the link to the strip above. Np. Thanks for the reminder. I got enthralled by working models of colonial fire trucks that I glossed over the link. Blahhh… no plot development. pure scenery, for the entire comic? These kind of “breather” comics are sometimes necessary. By weekly pace they may seem a bit tedious, but during reread they build up the atmosphere and intensity. It’s not waste, you are just impatient. I guess I’m having a bit of a mental incongruity. Normally, I like occasional scenery type comics. But this to me feels like a ‘stop and pause’ in the middle of a whole ‘go slow’ series of comics. Thats odd.. seeing as how they are all about a fire? O.O But that’s really the feeling i get when reading these last 5 or so pages. Trying to take a stand back and figure out why… I think perhaps its the colorscheme. I think there’s something about all that (purple?) that seems to make my mind say (this-is-not-exciting). Weird. Part of the point of having comics is for the art. The scene is beautiful, especially the lighting. Some of Studie Ghibli’s animations have very calm moments that are nonetheless enjoyable. Be patient. This is great, actually. I learned something new! And that video demonstrating how the fire engine works was neat. What a clever device. Who’s that, bottom of the last panel? Holding the fire hose?